John has been giving me a hard time about not using the bread machine he bought me awhile ago so I've been thinking about making bread for the last few days. It just so happens that on Saturday, while bored at work, I came across a recipe in the Metro for an easy and interesting loaf of bread. This morning I decided to give it a try. I promise you, this is likely the easiest loaf of bread you will ever make. If, like me, you've spent days cultivating starters, kneading until your arms hurt, and waiting patiently for bread to rise and double in size, this recipe will seem like a breeze. 45 minutes is all it takes to bake and there is no time spent waiting for the dough to rise. This recipe uses no yeast! It doesn't need to be kneaded! The only waiting time is when it's in the oven baking! The recipe from Metro suggested Molson Canadian 67 Sublime. I used Rickard's White but really you could use just about any type of beer you like best. Preheat oven to 350 degrees and grease a loaf pan. In a bowl, mix together 3 cups flour, 1 tbsp baking powder and 1 tsp salt. 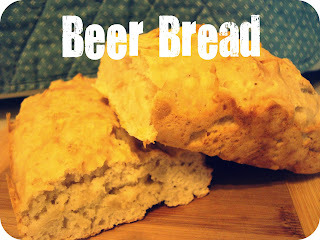 Create a well in the centre of the dry ingredients and pour in 1 bottle of beer and 1 tbsp honey. The Metro recipe suggests adding 2 tbsp chives (I omitted this ingredient, mainly because I didn't have any chives). Bring the ingredients together using a wooden spoon and stir until thoroughly moistened. Place in the loaf pan and bake for 45 minutes. The beer taste doesn't overpower this bread so don't worry about it not pairing well with sandwich ingredients or other toppings. This bread would be great dipped into thick soups or stews and would definitely work well with BBQ chicken. If you're looking for a quick and super simple bread recipe, this is an excellent go-to.